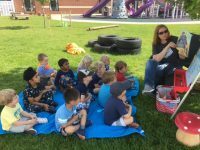 Our outdoor classroom is unique in that it uses our entire playground space. We have a very large playground and look forward to this outdoor classroom continuing to grow each year! 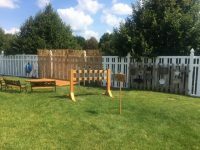 In the center of our classroom is a traditional preschool climber and located directly behind, is our natural/loose parts climbing area full of stumps, tires, a balance beam and more. 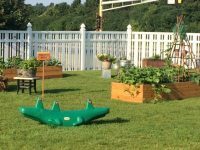 We are proud to have three full box gardens accompanied by many small container gardens for children to care for and explore. 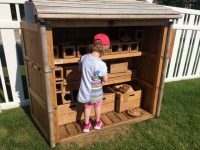 Included in these gardens, we have a fairy garden with many loose parts, as well as a dinosaur garden with rocks, plants and wood rounds to create and play. Our Nature Art area is located near the center of our space incorporating natural materials, as well as paints, markers, paper, etc. The children enjoy painting on our plexiglass easel and decorating our patio with sidewalk chalk! The Action Area, enjoyed by our many soccer fans, is located alongside our Music and Movement area. We have a large stage, ribbons and instruments, as well as ample seating for the audience. One popular item in this area is our pipe chime. The children enjoy tapping out “tunes” together. Another unique feature of our space is the many options to gather as a class. We have four different options for gathering spaces. 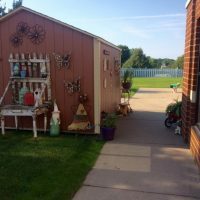 Our favorite simply seems to be throwing a blanket down in the shade, but we do have space on our stage, as well as in our art and garden areas. The building area is the first area you pass as you enter our space. It is full of unique and interesting objects to build and create including, spindles, wood rounds, shells, wood blocks, CDs and more. Our Messy Materials are growing week by week. 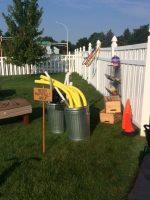 We currently have wood rounds, pool noodles, branches, and fitted piping. We also have large wood blocks for the children to build boats, houses, etc. to play in. This summer we plan to acquire milk crates and a few more stumps to further enhance this area. 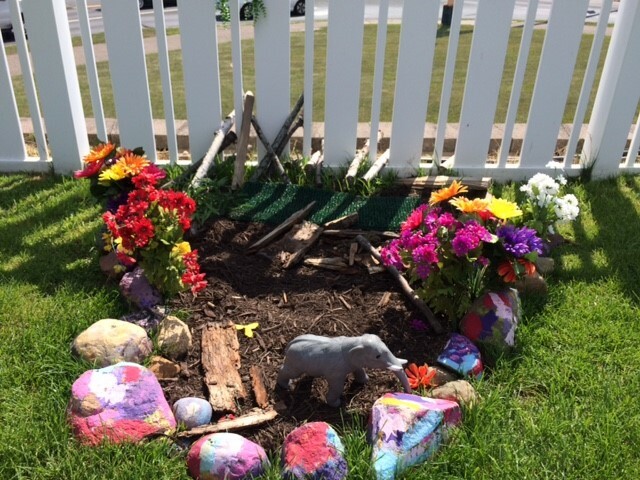 Finally, our preschool children enter this space through a sidewalk path happily decorated to welcome them into our outdoor classroom.